“Fusion” is intense – it throbs with the energy, creativity, and diversity of elements thrust together. As metal artists, fusion is the essence of our work. We struggle to fuse the concept and the reality; the union of disparate elements; the individual and the social. We struggle and we delight. 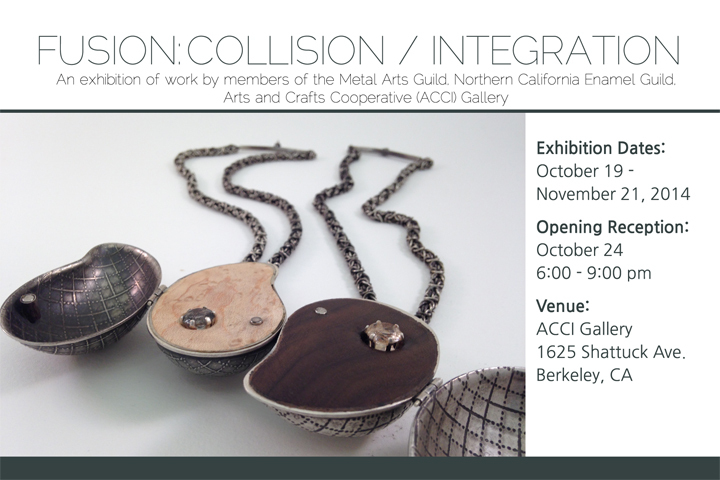 For the 2014 MAG / NCEG/ ACCI All-Member show, members of the Metal Arts Guild (MAG), Northern California Enamel Guild (NCEG), and ACCI Gallery will exhibit jewelry and sculptural works that explore the boundaries, integration / collision, and diversity of Fusion.